To find a Sugar Daddy and finding an upscale dating destination in Los Angeles can be a big and fun task every time. There are literally thousands of options available which can easily confuse you when trying to decide on one. Chances are you have already chosen the typical movie and dinner date a million times before. Although a movie date isn’t a bad option, in a city where there are so many other places to visit and experience with your Sugar Baby, you should be thinking of taking your sugar dates to the next level. One of the many great things about our Sugar Babies website is the fact that members can post trips and dates to make upscale dating a much smoother experience. Another reason for always trying new things in a sugar relationship is that an arrangement is the last place you’d want to get comfortable in. Sure, your Sugar Baby and you have gotten to know each other a lot in the past few months but that doesn’t mean you’ll start forgetting all the things that attracted you to each other in the first place. Newer experience brings people together and helps create memories. Your Sugar Baby expects you to treat her in the best possible way every time you meet. Here are a few ideas for you try the next time you take your sugar partner out on a date once you’ve connected using our Sugar Babies website. 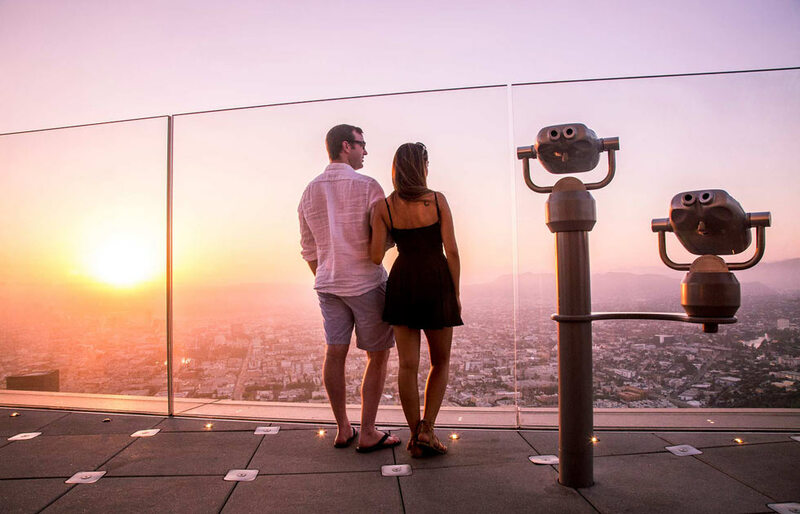 Arguably the most romantic and luxurious place for dinner in Los Angeles, the 71Above offers unparalleled panoramic views of the city. The restaurant offers a sumptuous three-course dinner and in an intimate setting. If you’re looking for a more casual hangout space, head to the bar at 71Above to enjoy the delicacies and order a cocktail you’ve never tried before. The food and views are both amazing which is why a night at 71Above will an experience that will remain with you for a long time. Sounds tempting right? The Sunset Champagne Helicopter Flight is where the romance maximizes and everything goes to the background for some minutes. You make it a flight-only experience or ask them to drop you to an exotic dinner location. The tour takes you to a 55-minute ride over the Long Beach, Beverly Hills, Hollywood, Downtown L.A and many other famous city landscapes. Add a champagne bottle to the deal and ride into the sunset with your Sugar Baby. This is your chance to see the city of Los Angeles like never before. What better to relax with your Sugar Daddy then at a spa as good as the DTox? The DTox spa offers various different kinds of treatments including facials and massages. You and your sugar partner will first be exposed to a steam room where you will warm up and get ready for manicures, pedicures and relaxing massages to follow. Not everyone can treat themselves to a day at DTox Spa because the services are expensive but that’s not a problem for a Sugar Daddy. Love riding through in-city streams but can’t travel to Venice? Don’t worry because there are plenty of service providers offering a Gondola Ride in Los Angeles’ waterways. Most of these service providers have special packages for Valentine’s and New Year’s but you can always ring them up and inquire about what they can do to make your date even more special. The Gondola Ride will be one of the most serene experience you’ll ever have with your sugar partner. One of the most gorgeous restaurants in Los Angeles, the La Boucherie is a steakhouse which also offers plenty of French-inspired cuisines. The restaurant is located on the 71st floor of the International Los Angeles Downtown. Looking for a separate space to enjoy dinner? The La Boucherie offers an unmatched private dining experience with stunning views of the city. The menu includes French cuisine, steaks, and seafood among other items. We know this can be considered as something that’s been overdone but there isn’t a substitute for a good old beach walk with your partner. Almost everyone likes a walk on the beach, unclose to each other with hand n hand and staring into the horizon together. If you Sugar Daddy or Sugar Baby likes being in nature and loves sunsets they will love sharing a beach walk with you.